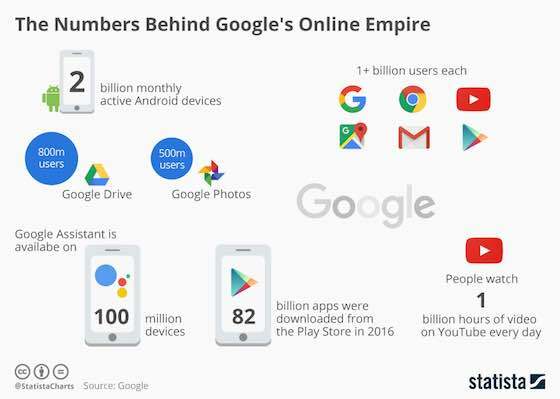 The recent opening keynote at Google I/O offered us a rare glimpse at some numbers behind the company's vast online offerings. Among other things, CEO Sundar Pichai revealed that more than two billion Android devices are actively used around the world and that six of Google's services have reached over 1 billion users. The numbers, summed up in the chart below, along with recent product/service introductions (e.g. Google Home or Google Lens) illustrate the company's ongoing efforts to move beyond search. As web usage continues to shift away from PCs and mobile browsers to apps and even voice-activated devices, people may not rely on Google search as much as they used to going forward. Considering that search advertising is still the company's main source of revenue, it would be careless for Google not to cover all bases. Business: "The Numbers Behind Google's Online Empire"